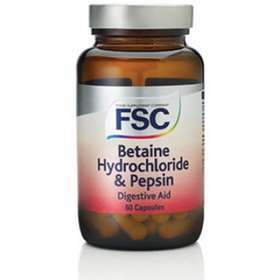 For optimum digestion this supplement aids the digestive balance with the provision of betaine to release hydrochloride acid along with pepsin to assist the digestive system. Pepsin is an important enzyme in this process of breaking down proteins in food and the hydrochloric acidity ensures the sterilisation during digestion. As we age the stomachs natural ability to produce this acidity diminishes and this digestive aid helps maintain levels to optimise good Vitamin B12 extraction during digestion. Energy, Protein, Carbohydrate and Fat - negligible . Adults and Children over 12 years of age: Swallow one to two capsules daily with food. Do not exceed the recommended daily dosage. Betaine Hydrochloride, Pepsin, Capsule Shell (Gelatine), Bulking Agent (Microcrystalline Cellulose), Anti Caking Agents (Magnesium Stearate, Silicon Dioxide) Vegetable Source.